83. B’nai B’rith International maintains two lodges in Ukraine, one in Kyiv and one in Lviv. Both are supported financially by a patron in London. The writer spoke with Felix Levitas, a longtime activist in Ukrainian Jewish life and current President of B’nai B’rith in Kyiv. In explaining his own background, Mr. Levitas said that his family had resided in Kyiv for many generations; some were killed in pogroms during the Russian Civil War in Ukraine (1918-1920). His father, continued Mr. Levitas, escaped from Kyiv in 1941 and returned to the city in 1944, finding that all of his relatives who had stayed behind had been slaughtered at Babi Yar. 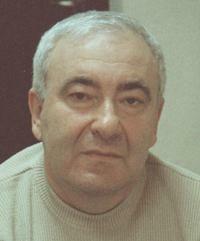 Felix Levitas is a former history professor and current President of B’nai Br’ith in Kyiv. Mr. Levitas himself learned about the Holocaust when he and his father listened in secret to Kol Israel broadcasts about the Shoah. Upon finishing high school, Mr. Levitas first worked in a factory as that was the politically correct path at the time. After accumulating the necessary labor credentials, Mr. Levitas subsequently studied history and then worked as a history teacher. As soon as conditions improved under perestroika, Mr. Levitas began to write books on Jewish history, including the Holocaust. His research led to a position at International Solomon University; he became Dean of Jewish Studies at ISU, a position that he left five years ago. He now teaches at a pedagogical institute, teaching graduate courses to history teachers returning for advanced degrees. Mr. Levitas also continues to do research and write about Jewish history. He has written about the Beilis trial, the Bund in Ukraine, and Babi Yar. In response to a question, Mr. Levitas said that antisemitism is no longer a major problem in Ukraine; it is confined, he continued, to a small rightwing political party and to some strongly bigoted websites. The most effective antidote to antisemitism, he stated, is more education about Jewish life in Ukraine, including the Holocaust. Trips to Israel also are very helpful, especially if Yad Vashem is on the itinerary. Tkumah, the Dnipropetrovsk-based Holocaust studies center plans excellent local seminars about Jewish history and the Holocaust, Mr. Levitas declared, but Tkumah lacks sufficient funds to organize the number of seminars required in Ukraine. Mr. Levitas himself conducts seminars for his education students and for teachers; whenever he can arrange financial support, these seminars include trips to Israel (and Yad Vashem). Regarding B’nai B’rith, Mr. Levitas said that its target membership group is Jewish intellectuals – professors, teachers, physicians, engineers, writers, and other cultural figures. Its programs in Ukraine emphasize Jewish culture and social welfare projects. They organize lectures on Jewish history and other topics. Their main social welfare work has three major directions. First, they provide food and medicine for 112 impoverished elderly Jews in Kyiv. Second, they also assist some 15 Righteous Gentiles, also all in Kyiv. Third, B’nai Brith provides some help to impoverished Jewish war veterans in Kyiv. Mr. Levitas readily acknowledged that the majority of B’nai B’rith members in Kyiv are over 70 years of age and that their numbers are declining. At its peak, said Mr. Levitas, Kyiv B’nai B’rith had 80 members; it now has 55. The Lviv lodge is younger; it has attractive offices and has organized exchanges with B’nai B’rith lodges in Poland and England. Kyiv B’nai B’rith uses office space provided by Arkady Monastyrsky of the Jewish Forum of Ukraine. In addition to the major subsidy provided by a donor in England, Kyiv B’nai B’rith receives certain project grants from JDC. 84. The Jewish population of Ukraine continues to decline in numbers, weakened by emigration of its younger and more strongly Jewishly-identified individuals and by intermarriage, assimilation, high mortality, and low fertility of those Jews who remain. Jewish population centers exceeding 10,000 individuals exist in only five cities – Kyiv, Dnipropetrovsk, Odesa, Kharkiv, and Donetsk. 85. Remnant Jewish populations reside in scores of Ukrainian cities and towns, 20 individuals in one place, perhaps 800 in another. Such demographic clusters invariably are predominantly elderly; equally invariably, Jewish organizations find it economically prohibitive to provide a full range of services to people in such small population concentrations. Young Jews flee these locales, seeking higher education opportunities in larger cities that many may find appealing as future residences. Jews from the periphery also constitute a disproportionately large segment of those Ukrainian Jews who emigrate to Israel. Nonetheless, as long as some Jews remain in these areas, Jewish organizations will continue to grapple with the issue of service provision to small Jewish population clusters. 86. Intensive residential experiences – summer and winter camps for children and youth, family camps, seminars, and Shabbatonim – are known to provide a format in which skilled practitioners can transmit a sense of Jewish identity. Such formats are inherently expensive as they require transportation, lodging, food, program materials, and competent staff. Further, these experiences are most successful when conducted as a well-planned sequence of events, e.g., summer camps followed by winter camps, a Shabbaton followed by a longer family camp, etc. Almost all sponsoring organizations of these programs now require some payment from participants. 87. Provision of welfare services to individuals in remote areas is even more problematic. Basic medical care in these regions is often lacking, housing conditions may be primitive, and some residents may be hesitant to accept Jewish-sponsored assistance in the presence of suspicious less fortunate neighbors. 88. In a land both rich and terrible in Jewish history, some Ukrainian Jews remain absorbed by their collective past, exploring the events of those years that Soviet rulers had forbidden them to acknowledge. Expeditions to sites of historic Jewish significance are popular. Resources are sought to demarcate and preserve old cemeteries and Holocaust massacre grounds, to build monuments to the slaughtered at sites of mass shootings. Clearly, the Jewish identity of many Ukrainian Jews is defined less by Jewish religious tradition, contemporary Jewish culture, or Zionism, than by a vaguely understood Jewish cultural legacy against a background of successive tragedies. Examination of this history has provided a gateway to Jewish identification that many post-Soviet Jews have found elusive through other institutions. Such programs as academic Jewish studies, secular Jewish seminars, Limmud, Hillel, Taglit, Masa, Jewish camping, and heritage travel that build on this complex history may indeed encourage a cultural Jewish identity and sense of Jewish peoplehood that is consonant with contemporary Ukrainian Jewish life. A strong Jewish religious identification may or may not follow. A strong identification with Zionism and Israel may be a consequence of such Israel experiences as Taglit and Masa. 89. Contemporary Ukrainian Jewish emigration to Israel is almost entirely a consequence of local economic malaise and political anxiety. The Jewish Agency for Israel, which actively encourages and facilitates aliyah (immigration to Israel), is well aware of these conditions and operates its programs accordingly. It is seeking resources for strengthened Israeli experience programs and is emphasizing person-alized aliyah and enriched absorption assistance in Israel. See pages 96-97 for information about International Solomon University. Righteous Gentiles are non-Jews who aided Jews during the Holocaust, often providing shelter that concealed them from Nazis. The Jewish population of Russia is even more concentrated, with significant Jewish populations only in Moscow and St. Petersburg.